Solid wood and stained in choice of 5 finishes. Rubber foot pads protect countertops and prevent sliding. 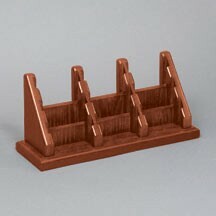 Accommodates standard 3-1/2"w x 2"h business cards. Shown in cherry.